Here are some important points which I find and used to improve performance of my store procedure. I hope this will help you to. 1) Try to use where clause for restrict result. 2) Use predecessor “dbo.” for tables. 4) Try to avoid “OR” condition use “UNION” over there. 5) Try to avoid “IN” Operation. 7) Try to avoid “DISTINCT”. 8) Try to avoid “CROSS JOIN”. 9) Try to avoid use of Temporary Table but if needed then define pre structure for that. 9) Define PRIMARY Key & UNIQUE Key Constraint for each table. 11) Include “SET NOCOUNT” at the first of your store Procedure. 12) Try to avoid “CURSOR”. 13) Use “UNION ALL” Instead Of “UNION”. 14) Try to create INDEX. 15) Create Index on column which is frequently used in Where, order by & Join. 16) Try to create index on Integer Column. 19)Use Explicitly Index “With( INDEX( INDEXNAME)) with table. The above 20 points I used and my store procedure is fast. If you people try to use above 20 points then it will beneficial to you also. Rest if you need any kind of help of me and my SQL Expert friends then you can just put comment. Today we just try to make a sample project so I am taking here task to make a simple friend List in that list we can add friends and view friends. 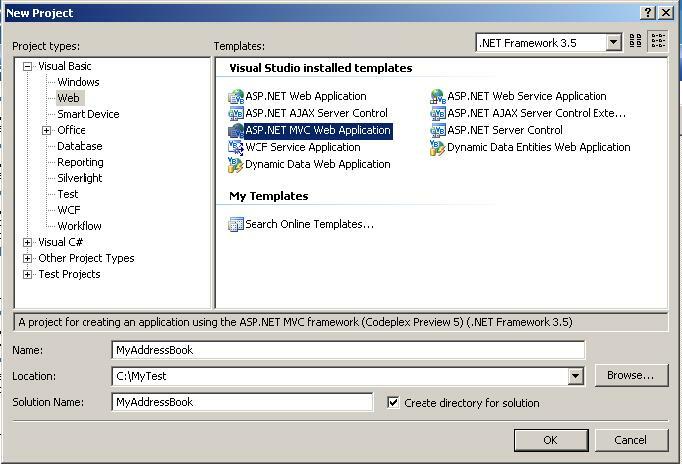 Step 1:- Add A project for Asp.net MVC as shown in below fig. 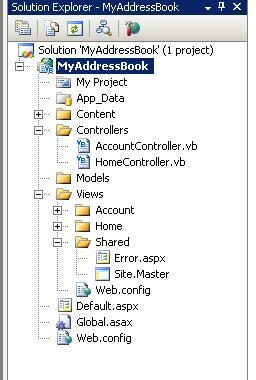 Step 2:- once you done with this you will find default folders of Views, Model and controller. The point to remember here is all the presentation layer comes in views folder and if there is sub folder in views so there must be a controller with that particular name. As you see there is home folder in Views so in controller folder there must be Home controller exists. 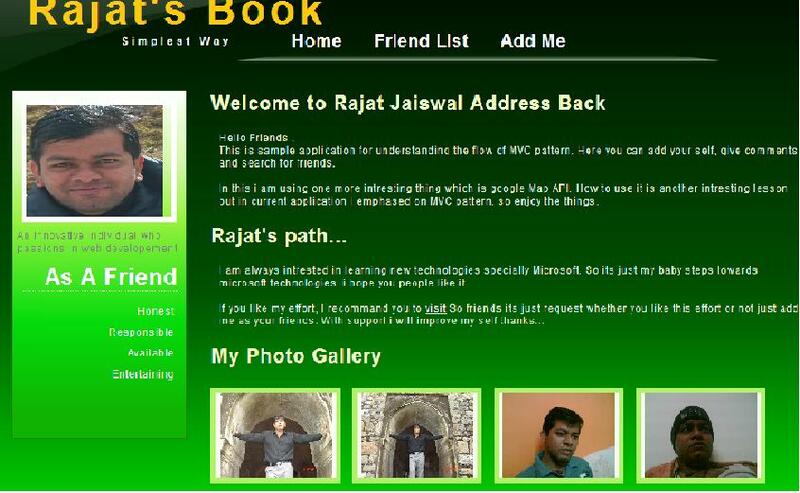 The view name or we can say our page name will be the function or procedure in controller. So in our project there must be a product controller and in that controller there must be a sub routine for product List. There is also a shared folder in our application which is mainly used to keep shared views like Master Page & other custom controls. 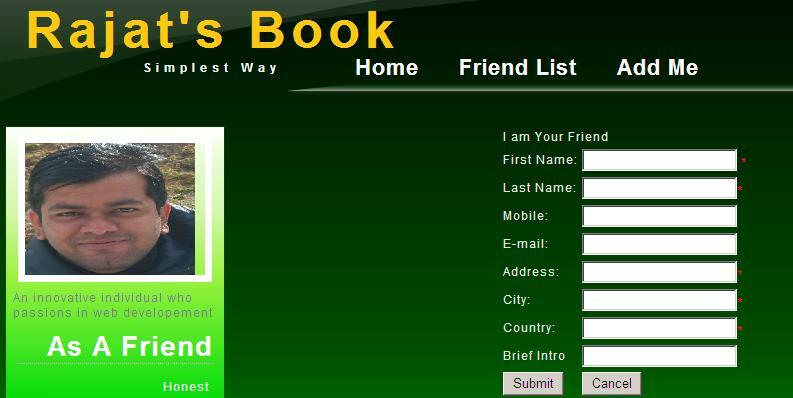 2) AddFriend.aspx :- It is used to add friends in our database. 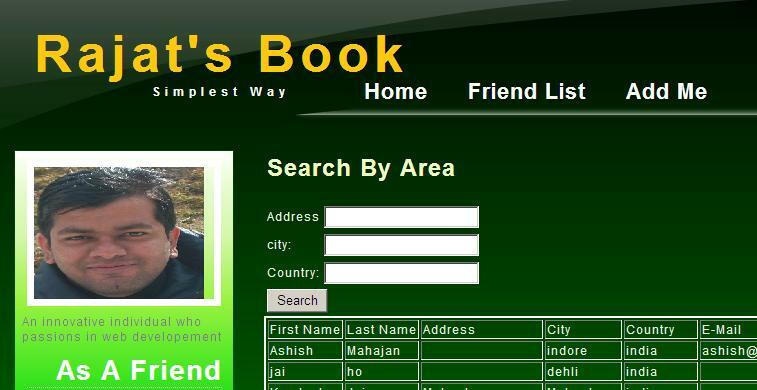 3)ViewFriends.aspx:- it is used to search friend by location. 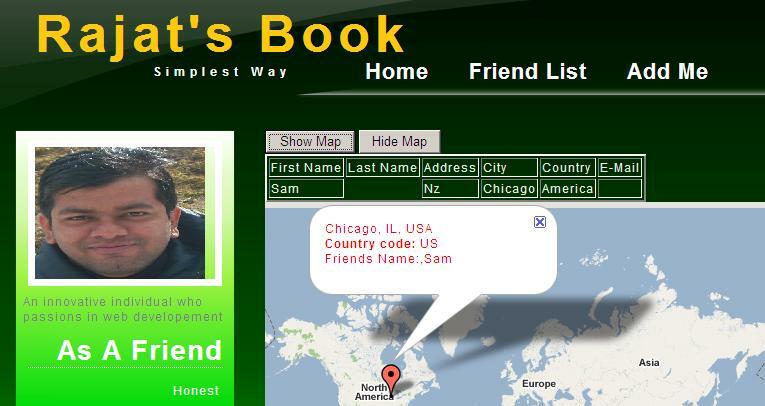 3)SearchFriendsByArea.aspx:- it is used to find location of friend on Google map. Step 4:- Now we create a database for it. In our database there is single table which is “TblFriends” with field lngId, strFirstName, strLastName, strEmailAddress, strAddress, strCity, strCountry, strphone,strBrief intro. Step 5:-Now and LINQ to SQL class which is “FriendsDb.dbml” in Model. This is use to intract with Database. Once you done with this. Now we think about how the data will save from add friend.aspx. For this we just mention another function in home Controller which is Save Friend. Save Method have all the parameter which is on the form like, strFirstName , strLastName etc. Once you got all the require parameter we just going for add as shown below. Here the things to understand the Return view Parameter. The Return view parameter is again a data collection which we will provide to search Friend’s View. Means we provide View Data a data list of Linq Class which is MyFriends. Now we can use it in aspx page. So in this way we just add records and view data.